I originally saw Toy Soldiers during its theatrical run in the early 90�s. At the time I thought it was a pretty cool movie. It took a somewhat simple idea and managed to keep the comedy and action at just the right level to keep it from getting dull. 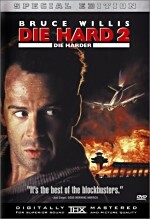 I remember walking out of the theatre reasonably happy with what I had just seen � it was a good popcorn flick. Sure the movie wasn�t going to win any awards, but at the time when all I wanted was a little action and entertainment - that�s what it delivered. I have always enjoyed the movie, and have even gone on to rent it a handful of times since then. On a boring day with the rain coming down you could always go to a video store, rent 5 movies, for 5 days, for 5 bucks and kill off an evening. For me, Toy Soldiers always made a good choice on a day like that. Admittedly the last time I rented the movie was somewhere between 5-6 years ago. Considering it�s been over half a decade since the last time I viewed it, I was wondering if I would still like the movie when I reviewed the DVD as much as enjoyed it back then. As I�ve grown older I�ve become increasingly aware of how certain movies can become dated rather fast. Especially movies that involve teenagers and are intended to be hip. Teenagers in film tend to reflect the trends of the time far more closely than the adults. Fashion, hairstyles� whatever. My point is, I wasn�t sure if this movie was going to be as cool as I remembered � and that worried me. After all this time was it possible that a film I used to love might suddenly and seemingly overnight become cheesy and clich�? Well I was about to find out. 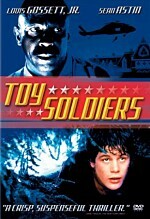 Toy Solders stars Sean Astin as Billy Tepper. Although Astin had appeared in several other notable films, at the time I knew him primarily for his roll as the asthmatic Mikey in the popular 80�s film: The Goonies. Most of you however know him more recently for his portrayal of Sam Gamgee in Peter Jackson�s: The Lord of the Rings Trilogy. In Toy Soldiers, Astin�s character of Billy Tepper could essentially be considered the ring leader for a troublesome group of friends who attend the Regis School. An all boys prep school that also happens to be home to a student body made up of rejects. You see, most of these boys have a serious problems with discipline and authority. About half of the students are comprised of kids who have been thrown out of other schools � and the Regis School is for many their last chance at straightening themselves out. At first appearance, Billy Tepper and his four buddies seem to be a few of the more popular and respected kids at their school. Their antics, which range from selling vodka and peppermint schnapps in mouthwash bottles to sneaking the contents of the headmasters entire office out into the quad has pretty much staked their place among their classmates. In fact, their reputations seem to pretty much ride on the crazy stunts they pull � and as the films moves along, it�s their knack for getting into trouble that pretty much carries the story. What is also made clear early on in the film is that they�re not entirely sneaky. The schools Dean, Dean Parker (Louis Gossett Jr) pretty much knows who�s responsible for the pranks and acts of rebellion about 95% of the time. Dean Parker rides Astin's character pretty hard, but at the same time you can tell he respects the kid and knows he�s only trying to have a good time. With the film laying out the character personalities rather quickly, we move on to the main plotline. When a Columbian drug lord is taken to prisoner by the American government, the man�s son, Luis Cali (Andrew Divoff) reaches the conclusion that the only way to free his father is to take some rather serious and drastic action. With a small army of about a dozen men, a cache is military equipment ranging from small arms to 50. calibre machine guns and rocket launchers, he sets up shop at the Regis School. Wiring the building to explosives, which can be detonated by simply pressing a button on a device strapped to his wrist, Cali holds the kids and some of the faculty hostage. It seems that even though a majority of these kids are misfits, they also happened to have parents of great importance. Parents who own large corporations and have both political power and influence. Cali�s plan, to hold the kids hostage until his father is released from prison. A simple plan I supposed, but not as simple as he might expect. As I mentioned, Tepper and his buddies aren�t the kind to sit back and do nothing � and with the aid of his friends, Tepper plans to do something about their unfortunate situation. Over the course of the next several days all the students are kept under close guard, being counted every hour on the hour to make sure none of them are trying to escape. If their numbers are short, Cali plans to execute 5 people for each missing student. Naturally it doesn�t take long for news of this hostage situation to reach the outside world � and soon the media, as well as the United States Army take up position outside of the Regis School�s gates. Even though Tepper and his friends can�t do much as far as planning a way out, they can do something to help the people on the outside. Over the next day or so, Tepper and his 4 friends assemble as much information on the terrorists as humanly possible. They count how many of them there is, mark their locations on an aerial photograph of the school, figure out the kind of weapons and other ordinance they possess and even draw of few sketches of their leaders. Now if they can only devise and plan to get their information to the military, they might be rescued. Once they have assembled the information the film really starts to pick up some steam. Soon, tense and stressful situations seem to play out over and over again. A few minor plot twists are also thrown into the mix with Tepper�s buddy Joseph Trotta (Wil Wheaton). Trotta just happens to be the son of a New Jersey crime boss. A crime boss who has connections with Cali�s imprisoned father. Overall the film is really somewhat of a mixed bag. While not as great as I remember it being the last time I saw it, Toy Soldiers still remains a fairly entertaining and engaging experience. 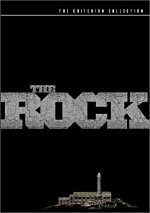 While the movie does have it�s cheesy moments, and occasionally suffers from some truly lame dialogue, a majority of the film plays out rather nicely and the �edge of your seat� factor remains fairly consistent � even if a little light-hearted. The acting in the film is also fairly solid � although Astin�s performance is perhaps one of the least interesting of his career. On the flip side, Wesley Crusher� umm, I mean Wil Wheaton is surprisingly good and doesn�t get on my nerves quite as much as the young Ensign of Star Trek fame. Andrew Divoff, who plays the terrorist leader Luis Cali is simply awesome. He takes his role very seriously and does and excellent job of portraying a man who will do anything he must to get what he desires. He plays a perfect cold blooded and remorseless killer � and remains very convincing throughout the feature. Toy Solders is unfortunately presented in fullframe with an aspect ratio of 1.33:1 � This being the case, it has not been enhanced for widescreen televisions. As expected the picture quality of this DVD is fairly solid throughout. The image was fairly clean and sharp during a majority of my viewing, and I detected only a hint of fuzziness, an occasional speckle and a wee bit of grain. For a film that�s nearly a dozen years old, the picture was right about what I expected. Nothing more, nothing less. Ok� maybe there was a little less, but I�ll get to that later. Colour saturation and black levels were also very nice. The video defects you expect to see during a particularly dark scene were kept to a minimum and overall the film�s colours looked very natural. 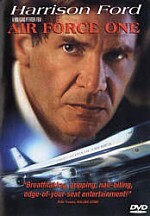 This film provided fine visuals throughout, no particularly huge problems. If I had one beef with this film�s picture presentation, it would have to be the studios decision to avoid a widescreen release. I just don�t understand it. In a time when 90% of DVD�s on the market are widescreen, I found this to be a little surprising. Sure there are plenty of fullframe DVD�s out there, but they are usually provided for big name releases, like Star Wars, Spider-man or The Lord of the Rings - and with those titles, they give you a choice. If you want fullscreen, buy fullscreen, if you want widescreen, buy widescreen. While I�m glad to have this film as a part of my collection, the second a widescreen version is released this sucker is history. For shame, the studios should know better. Toy Soldiers come with a basic, yet acceptable stereo surround audio track. There really isn�t a whole lot to say here, as the sound starts and remains clean, crisp, clear and intelligible throughout the picture. Voices and sound effects are natural and never become either edgy or tinny. Rear surround activity is fairly light during most of the movie and usually makes it�s presence known during scenes involving music. However, the rear surrounds weren�t restrictive to just music and worked well to make the overall sound field seem fuller when necessary. The sound in this film wasn�t amazing by any stretch of the imagination, but it remained solid and for the most part � positive. The one and only bonus on this disc is trailers. And while that might be construed as a pretty weak set of extras, the word �weak� is punctuated by that fact that none of the trailers are actually for this particular film. Nope, you get trailers for Enough, Panic Room and Soul Assassin, but no Toy Soldiers trailer. For shame. Well this is certainly going to be a first for me. While I normally have the tendency to ramble on like there�s no tomorrow, it would seem as though this particular review has the makings to become one of my shortest. Simply put, there�s just not a whole lot to say. Toy Soldiers as a film captured my interest quite easily back when it was originally released. It was fun and hip, it provided a good amount of suspense and action, and even thought you knew what the ultimate outcome of the film would be, you were never quite sure how it would get there. Today, the film fortunately possesses many of those same elements. Sure it�s a little corny, but most films are when they get older and you start to notice the difference between kids today and the kids back then. Still, Toy Soldiers remains a fairly strong picture in my book. A majority of the film is rather exciting and suspenseful, and a majority of the acting is strong and professional. It�s not a perfect movie by any stretch of the imagination, but to this day, it still remains one of my favourites from the early 90�s. While the film is decent, the Toy Soldiers DVD is somewhat of a letdown for me. I find it hard to accept the film studios decision to release it in fullframe only. I think DVD fans have certain expectations these days, and fullframe is just not acceptable to most enthusiasts. Fullframe is nice as a secondary option, but first and foremost, I think we all want to see the widescreen transfers. Who knows, maybe one day we�ll get what we want � and when that day arrives I�ll have this shiny new coaster to rest my coffee cup upon. Toy Soldiers offers an entertaining, suspenseful and albeit a slightly light-hearted affair. The picture quality is fairly solid and the sound is decent as well. Unfortunately the total lack of special features did little to positively impact my overall opinion of this disc. While diehard fans of Toy Soldiers are sure to pick up the film without hesitation, film purists will probably want to wait it out for a widescreen addition. Toy Soldiers is a great film with a good transfer and acceptable sound, but this DVD has many strikes against it - and will probably be a disappointment for most.